The Pauline Center for Media Studies hosts the Media Literacy Certification Course, "Forming Digital Disciples"
This past July saw a group of catechists and other interested Catholics joining the Pauline Center for Media Studies (PCMS) in Los Angeles for the annual course in Media Literacy, which is part of the catechist certification in the Archdiocese of Los Angeles, but can also be helpful for those in ministry from all over. The course was held from July 15th through 21st and was an intensive week. The course, called “Forming Digitial Disciples: Media Literacy Education in Faith Formation” helps Catholics involved in any kind of ministry in the Church to obtain the media literacy skills so essential to navigating our media-saturated world so they may pass these skills on to those they teach and care for. Through media literacy education, participants were able to develop an understanding of the power of media and how it influences our lives. Media literacy, which gives us the skills to analyze the media, question it, and integrate our values into media choices, has been called an educational imperative for the 21st century. The course was given by the three full-time members of the Pauline Center for Media Studies: Sr. Nancy Usselmann, the national director of the PCMS, Sr. Hosea Rupprecht, the PCMS’s East Coast director, and Sr. Rose Pacatte, the founding director of the PCMS. Joining us for the week were six people, dedicated to their ministry in the church. 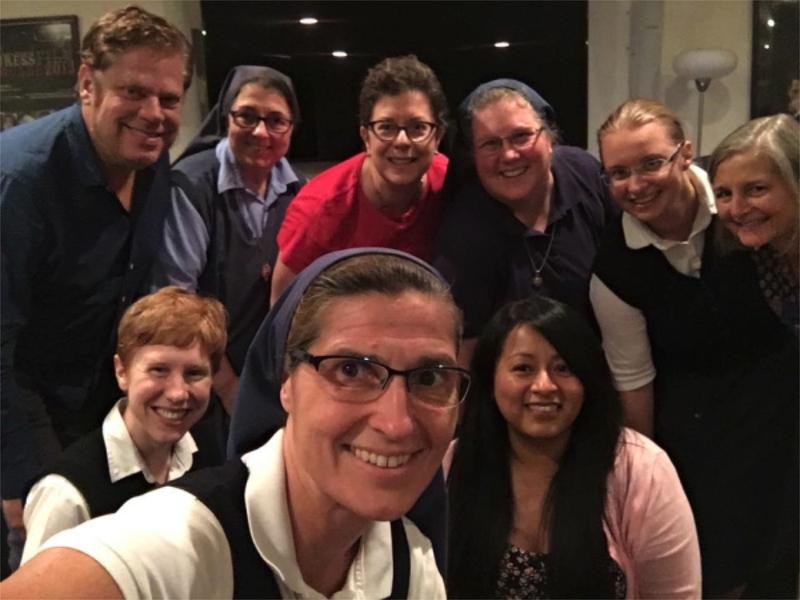 Three were catechists, one a Pauline Cooperator (a lay association connected to the Pauline Family), and two Daughters of St. Paul novices. The “Forming Digital Disciples” course consisted of three main sections: the catechetical foundations of media and faith formation, presentation of the key concepts of media literacy and the media mindfulness strategy, and the application of those principles in the practical setting of Catholic ministry. 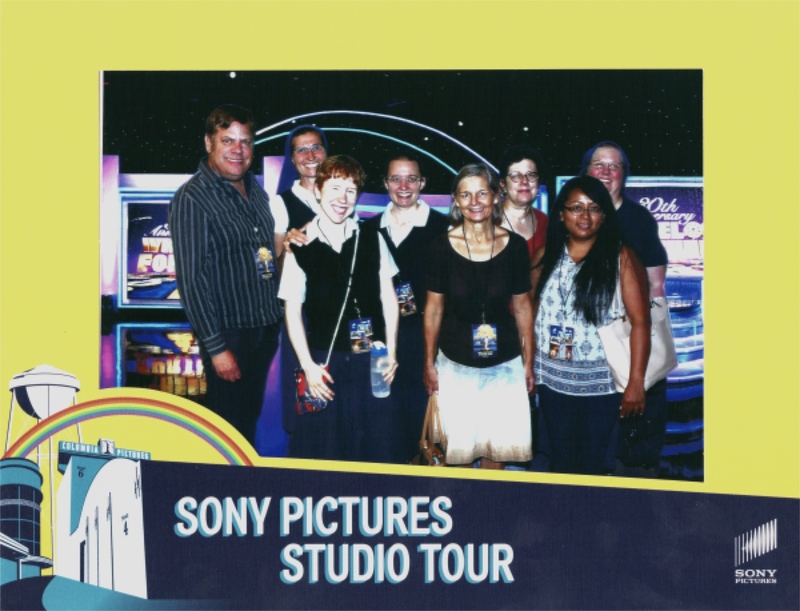 Because a better understanding of how media is produced is a part of media literacy education, the course included a trip up the road from the Center to Sony Studios for a studio tour. The culmination of the week was the presentation of the student projects. The project consists of one practical way the student see themselves integrating what they learned in the course into their ministry. All six students presented amazing projects that showcased their learning. The student who teaches 1st grade catechism, did a lesson plan which included a clip from a film, with questions to draw the children into talking about the topic. Another student developed a presentation to prospective vocations integrating film clips. Another student, whose ministry is to prepare children for First Reconciliation and First Communion, used the Media Mindfulness strategy to draw children into a conversation about the Eucharist. A new aspect to this year’s course was the online forum for readings, activities, and feedback. It enabled the students and teachers to have a place to exchange ideas, submit assignments, and keep helpful information together online. Check back to bemediamindful.org for information on next year’s course.